Welcome back for the 2018-2019 school year! This year we welcome our new Library Media Specialist Miss Stewart. Visit the link "Meet Miss Stewart" to learn more about Crestmont's new LMS. We look forward to a great school year! One day a year I put on my hat and waltz into work dressed like a cat! We had such a great time celebrating Dr. Seuss' Birthday! Throughout the week we welcomed guest readers, ate birthday cake, completed some fun STEM activities seuss style, & read more books than we could count. Kicking off March Madness with multiplication madness & sight word slam challenges! I love this team and our "coach" Dr. Prince! 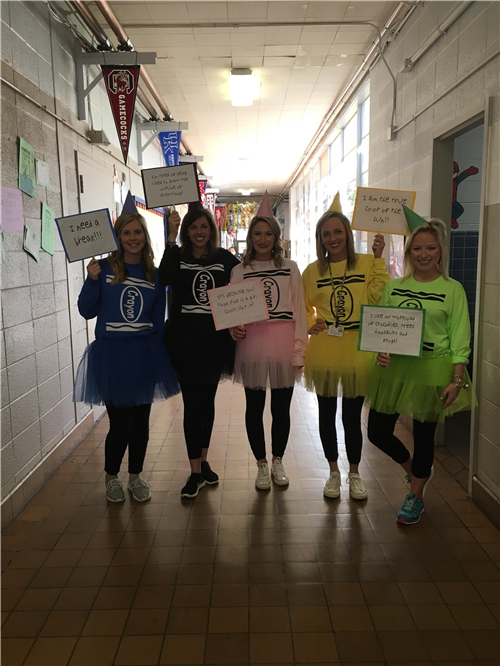 They go above and beyond daily to support our Crestmont Wildcats! Words can't express how proud I am of this years Battle of the Books jr. team! They practiced diligently for weeks and were such a fun group to coach. It was a day filled with ups and downs as we won our first round, but lost the next two (by 1 point). They wanted to win so badly, but the encouragement and praise they gave each other as well as other schools was what this competition is all about! Proud to call them Crestmont Wildcats!!! As many of you may know we have a beloved student who has been very sick for several weeks. I am so encouraged to share that he was able to stop by for a short visit recently! One of his first requests was to checkout new library books & what a joyful trip to the library it was! Most people think the adults are the only teachers in school buildings....this young man has taught me so much about never giving up and continuing to be joyful in all circumstances! My heart is full and I look forward to the day that he will be able to join us again full time! Perks of being the Adopt-A-School committee chair/co-chair....you get to ride in the West Alabama Christmas Parade dressed as gingerbread people! We love our adopters at Spiller Furniture & Mattress! Crestmont is Wild About Reading! We want to take a moment to thank our Wild About Reading sponsors at TTL. Each year TTL provides donations that help support our prize incentives for the Acclerated Reader program. This years Wild About Reading pep rally was even bigger and better than years past! The students loved getting to see Big AL, the TCHS cheerleaders, & even a few Crimsonettes! Thank you again for all you do to encourage our students to reach their goals in Reading! WOW! October is always such a fun and busy month here at the Crestmont Library! 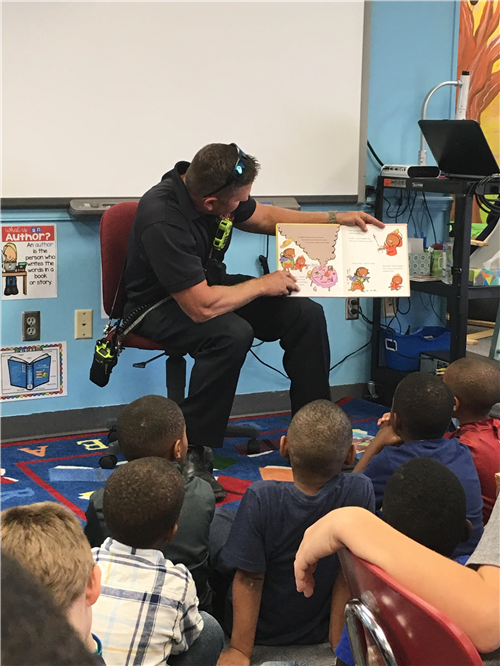 We had a blast welcoming the Northport Fire Department this month as we turn our attention to fire prevention. We also dressed up to celebrate our annual book character parade which was lead by the one and only Monkey Joe! It's wonderful to see continued support from our community. These special events are reminders that our students are loved and blessed by their community! What are Makerspace Mondays? Every Monday the library is open for Makerspace lessons. Teachers can sign up to bring their class to participate in a Makerspace lesson that will expand on the standards currently being taught in the classroom. Makerspace Mondays are all about creating, engineering, collaborating, and inventing. The lessons focus on STEM related activities such as Science, Technology, Engineering, & Mathematics. Every year I brainstorm new ideas to help improve the functionality of our library. I recently came across the neatest shelf markers and was thrilled at the prospect of adding these visuals to our nonfiction section! It's amazing how adding something as simple as shelf markers can make such a big difference. Here's to another fabulous year in the Crestmont library! Happy Reading! The 2nd annual St. Mark United Methodist free book fair was a huge success this year! The women of the Elizabeth United Methodist Subgroup work diligently each year to collect and donate thousands of books that all go directly to our students here at Crestmont. 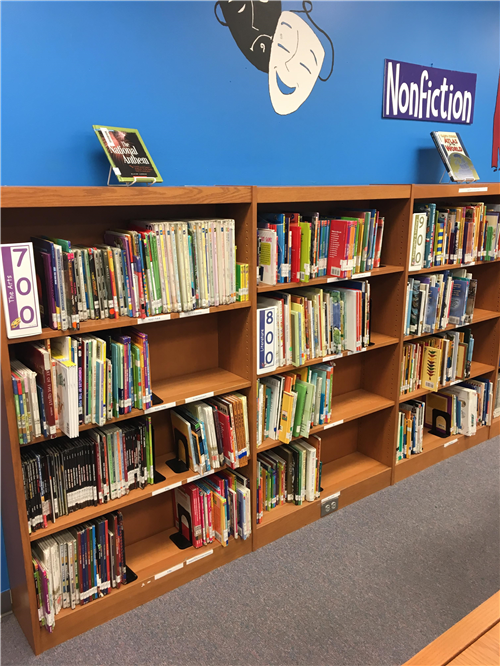 The mission of this partnership is to help meet the academic needs of our students by providing reading material for the summer months that students may otherwise not have access to. Crestmont loves these hardworking women and we can't thank them enough for their dedication and support!